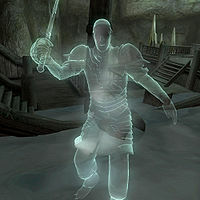 The Black Rock Pirates are three undead Dunmer who haunt Black Rock Caverns along with their captain. It seems their ship came to grief in the depths of the caverns many years ago and they have remained there ever since. Three pirates can be found in the deepest part of the cave, Lost Black Rock Chasm, with their captain. Two of them also appear when the necessary sequence of switches are activated in the first two zones. In the chasm, their time is spent endlessly pacing around the wreck of their vessel. Despite being in the Marauder faction all three pirates wear light armor, leveled boots and a cuirass, along with a random pair of lower class pants. They are all armed with a steel cutlass. 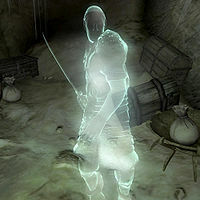 As a ghost, all three have 100% resistance against disease, poison and frost, and cannot be damaged by normal weapons. They can also walk on water. 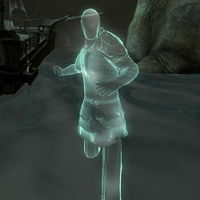 Another ghostly ability is their "Ghostly Touch" spell, which damages fatigue by nine points and drains it by 18 points, as well as inflicting 10 points of frost damage. They can also become invisible for 15 seconds. Neither of these abilities can be overcome by silence spells. In addition, the pirates each possess one leveled Restoration spell. In addition to a cutlass, this pirate fights using a leveled bow and arrows at long distance. He is one of the two pirates that attack after you activate the switches to reveal the hidden cavern. This pirate is actually three: the ones that wander around in the Lost Black Rock Chasm. This pirate is one of the two that attack after you activate the switches to reveal the hidden cavern. This page was last modified on 5 September 2014, at 03:50.